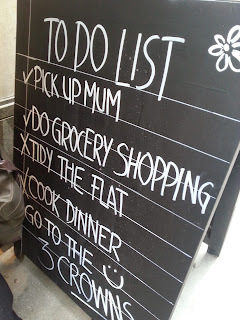 Tuesday 11th June - My friend Taro hasn't appeared on The List since his eventful trip to B.Y.O.C and Pitt Cue Co three months ago. He finally got back on the scoreboard last Tuesday, along with a few other friends from Kensington Symphony Orchestra, when we paid a visit to Inamo in Regent Street. After a quick pint in the cosy, well hidden Three Crowns pub round the corner, I met Taro, Anna, David, Rosie and Jason outside Inamo. Inamo is a Japanese interactive dining experience with two restaurants currently open in London - one in Soho and the other just South of Piccadilly Circus. 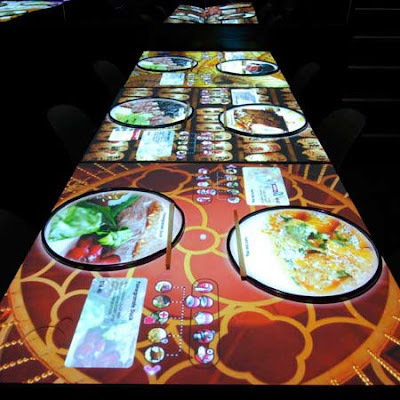 Every place setting has a projector directly above which beams down a stylish computer screen that you control with a touch sensitive mousepad. The most important use for this is ordering your food and drink. When you select different courses, a picture of them appears on your plate in front of you whilst drinks arrive almost as soon as you have pressed the order button. 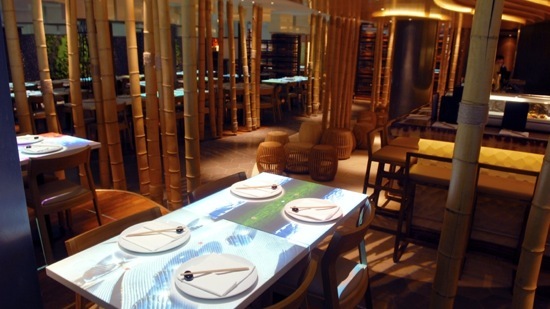 We ordered in a hurry as we were just in time to get their Spring Offer (2 courses for £15 or 3 for £20). 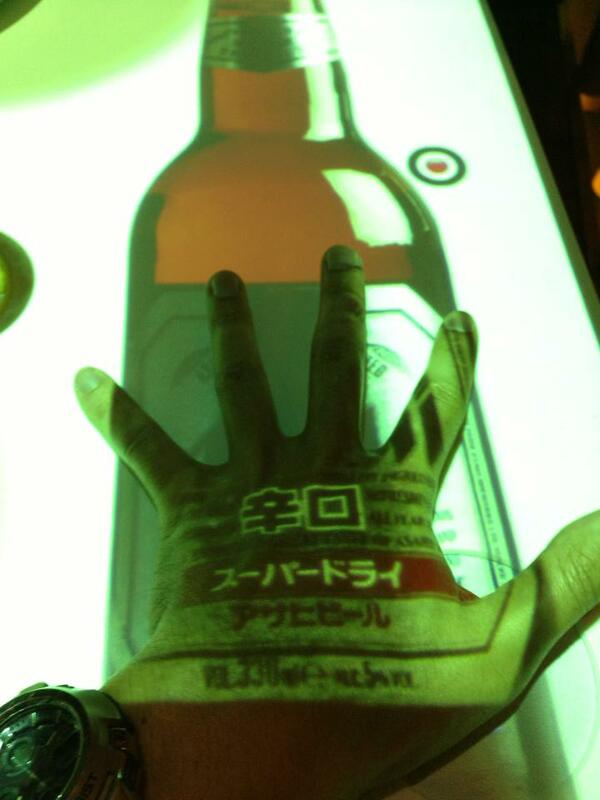 We then settled and started playing with the interactive screens. There are various games to play - Taro and I had 3 fierce games of Battleships. You can click on Chef Cam to see how the chefs are getting on. 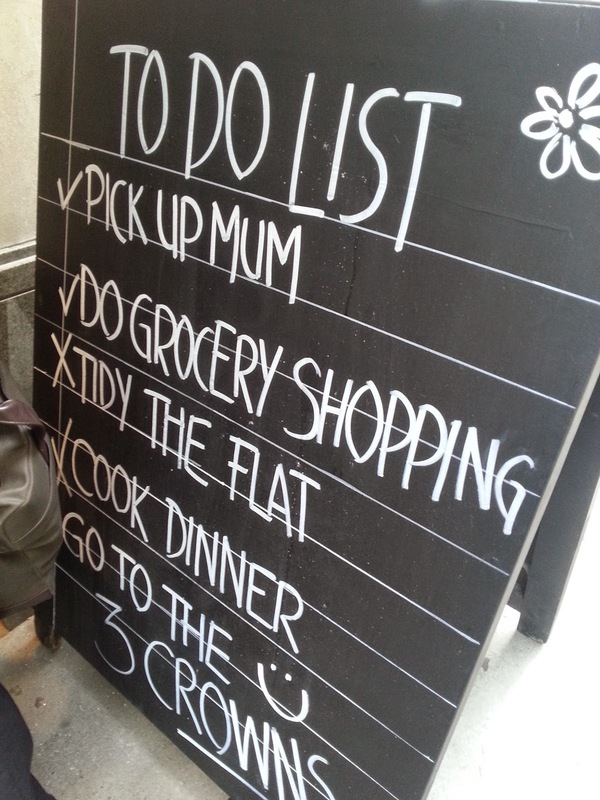 You can also plan ahead for the rest of the evening and even call yourself a taxi. We enjoyed being able to keep an eye on the mounting bill and individual totals (Taro with his ridiculous Chilli cocktail won the coveted "most money spent" award), and the "request the bill" button is something every restaurant needs! This would all be fairly pointless if the food wasn't up to scratch but luckily it was tasty, interesting, and well presented. Jason was happy with his first sushi experience (how has he avoided it?). Taro, resident Japanese dining expert, gave us all some top etiquette tips, particularly regarding the placement of chopsticks - put them in the wrong place and you might find yourself accidentally honouring the dead. Guess the sorbet trio flavours proved very difficult. 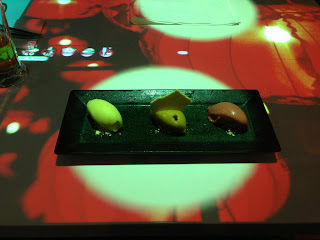 The waitress even had to go check - Fuji Apple and Ponzu, Strawberry and Yoghurt, and Carrot, Yuzu and Cucumber obvs. I can spot Ponzu sorbet a mile off. 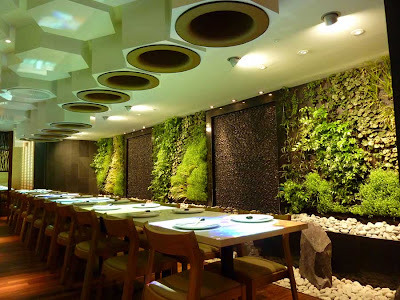 It's a good looking place too, with bamboo and sliding doors giving you privacy, plus a wall of water (or shimmering stones as two of our number thought) adding to the sense of calm. The Soho branch is apparently not quite as attractive but correct me if I am wrong! We actually ate everything in this picture. Flowing water or shimmering stones? Five of us were still up for a drink afterwards so I looked into some options. 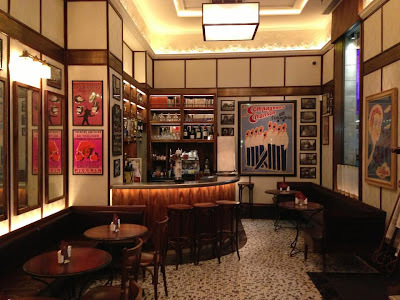 After being turned down on the phone by Milk and Honey for not having a reservation 24 hours in advance, we went instead to the charming Bar Américain in Brasserie Zédel. 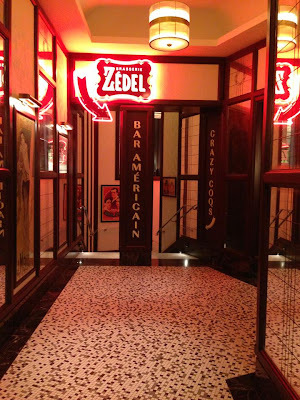 Situated right next to Piccadilly Circus, Brasserie Zedel blends in to its surroundings and most people probably miss it on their way in to Soho. The only thing visible is the ZL café, a beautiful, classic French coffee bar that I can picture myself reading a newspaper in with an espresso (if I ever did either of those things). Venture a little further in however and you will be rewarded. 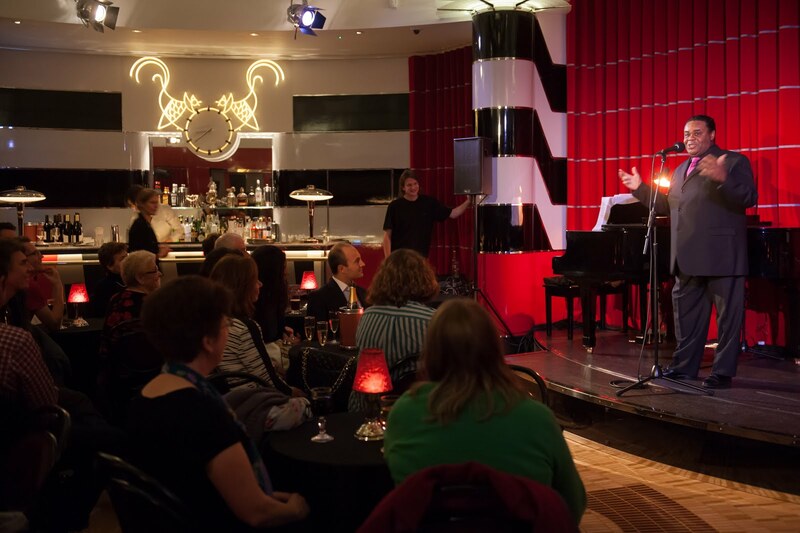 Head down the opulent staircase to find the Bar Américain as well as the Brasserie and the Crazy Coqs cabaret and performance venue, all through different doors from a wonderful Art Deco hallway. 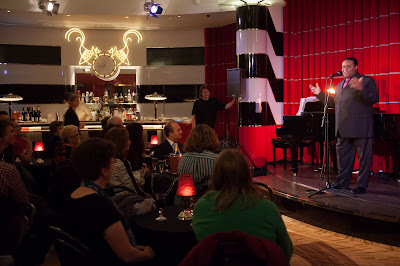 I would love to come back and try out the Brasserie and especially the Cabaret as it seemed to be buzzing as we walked past. The Bar Americain is a classy cocktail bar with cosy tables and a wonderful atmosphere. Once you enter Brasserie Zedel you no longer feel like you are seconds from the hustle and bustle of Piccadilly Circus allowing you to relax and enjoy your evening. They produced a very fine Aviation and a delicious Old Fashioned along with some nice mocktail Mojitos. 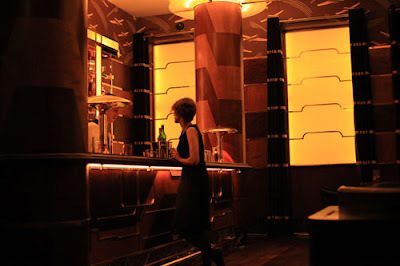 The beer choice of Pietra or Anchor Steam was enough for this type of bar. Free snacks are always appreciated too - olives and spiced nuts disappeared pretty quickly. 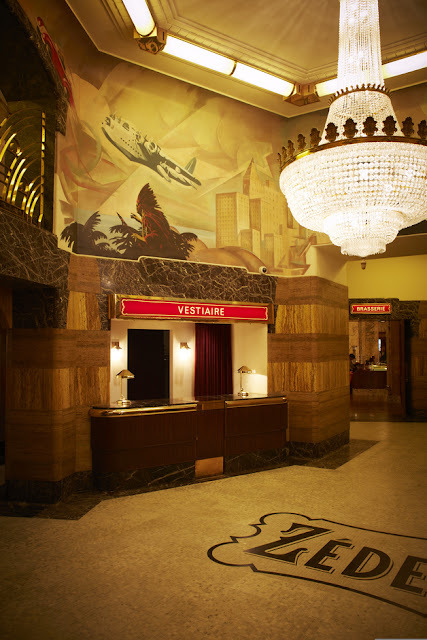 Check out this write up on the whole venue that I discovered whilst looking for some better pictures. 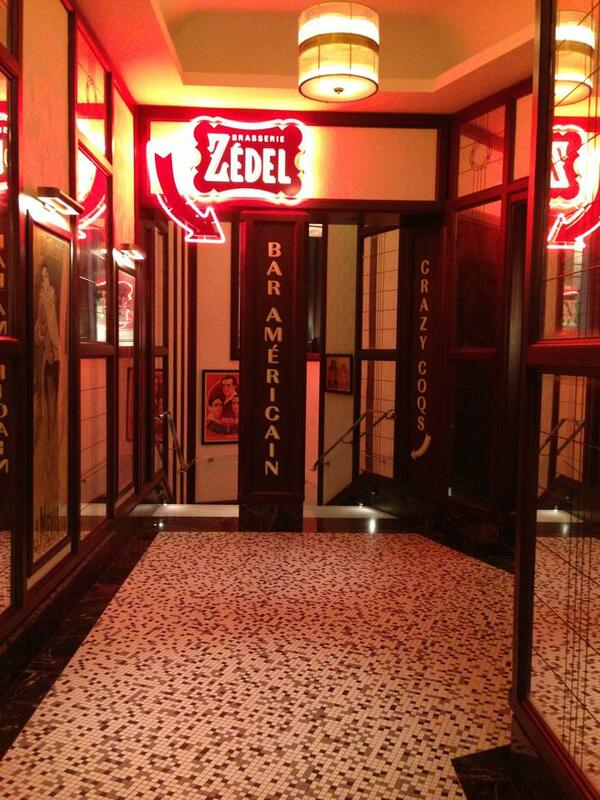 Don't judge a book by its cover - head inside and discover the delights of Brasserie Zedel! I couldn't leave Piccadilly without taking Taro to Cinnabon as he had never been. I'm amazed/upset that there aren't more of them around London. 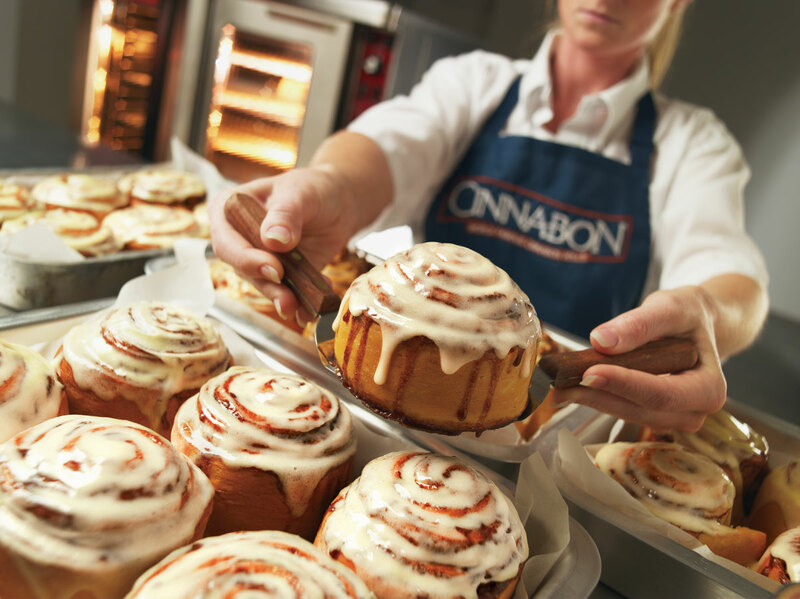 Cinnabon make the most indulgent cinnabon buns, and serve them all squishy and warm covered in delicious frosting straight from the oven. 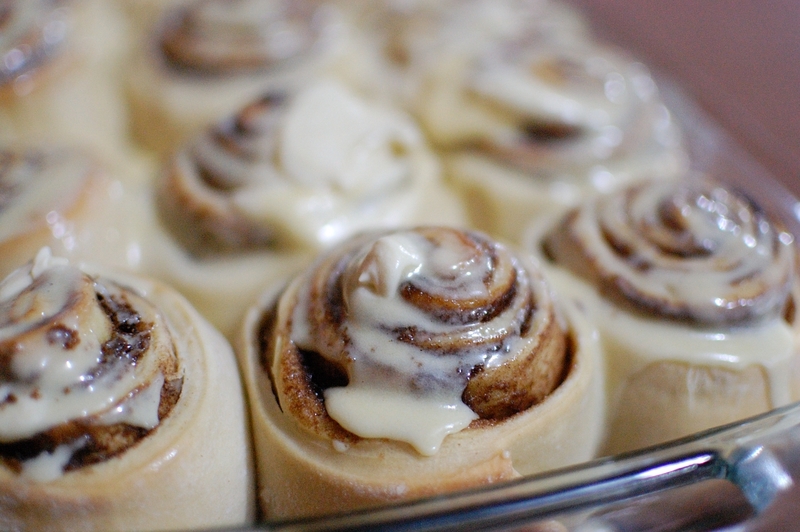 If you haven't had one then you need to go and get one (or order them to your door), and if you don't like them then there is something wrong with you - bring on the foodie baking community backlash. Here are some pictures for you to salivate over whilst I go and get on a bus to Piccadilly Circus for another hit, damn you Cinnabon. Thanks to Team KSO - come and see our final concert of the season on Monday 24th June in St.John's Smith Square at 7.30 and have a drink afterwards in the Marquis of Granby.